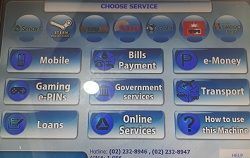 I was looking for drinks at the Alfamart convenience store at the ground floor of the Grace Residences in Taguig when I saw a TouchPay machine. I’ve read about it on the Paymaya website, so I decided to try to use it to load my Paymaya. It was easy, and the one-thousand peso bill that I entered into the machine got credited instantly to my Paymaya account. I immediately got a text from PayMaya informing me that my TouchPay load was already added to my PayMaya account. Prepare the amount you want to load. Know your Paymaya phone number. Only paper bills. No coins. The machine will NOT give you change. Awesome! You have received PHP1,000.00 on your PayMaya Account from Touchpay. The loading was instant. The text from PayMaya was just a few seconds after I pressed Yes. can i load 300 pesos at touchpay? Hi Big Bang: Yes, you can load 300 pesos. Minimum is 100 pesos.